Ready to reinvent yourself I know that I am? 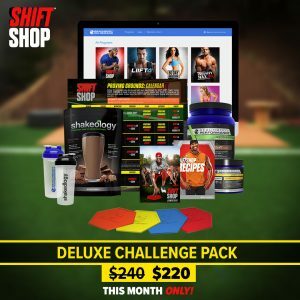 This morning I tried one of these workouts LIVE with Chris Downing here at the annual Beachbody Leadership retreat and within the first 12 minutes I realize that I have not been challenging myself like I know is possible. 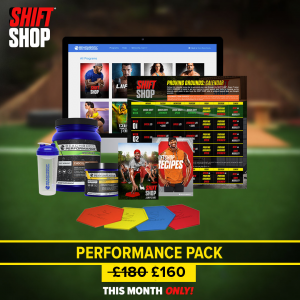 SHIFT SHOP PROVING GROUNDS is Chris Downing’s breakthrough conditioning program that has helped thousands of people of all fitness levels see maximum results in minimal time. 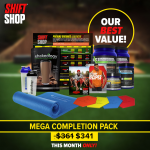 Heres the deal, he is brining you four brand new workouts to help take your fitness game and mindset to the next level. In the Shift Shop Proving grounds you will still use the “Ramp Up” method of increasing your workouts each day by 10 minutes, but this time they have added a Prep Week and new workouts designed to test your speed and strength as you get faster and stronger. APPLY FOR OUR TEST GROUP! Here’s how it will work if you want to do this program with me. You’ll start Prep Week with 15-minute Quick Shift workouts that give you a taste of what’s ahead and two Proving Grounds workouts that score your starting performance. Think of it as your baseline week. A place where you are CURRENTLY at — your goal is to only get better from there. Then you move on to 25-minute cardio and strength workouts, finishing Week 1 at the Proving Grounds with the goal of improving on last week’s score. Then comes the 2nd week, as your strength and stamina increase, you’ll be challenged to push harder with 35-minute workouts, consume more protein to fuel the burn, and stay motivated as you watch your Proving Grounds score climb even higher. I want to show you that the scale isn’t everything and you can find JOY in taking the challenging journey. 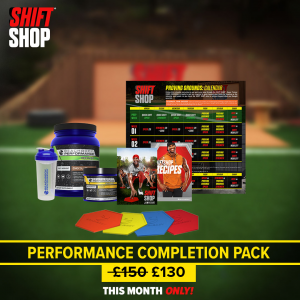 Finally, in Week 3, the workouts reach 45 minutes and your nutrition is even more dialed in for optimal burn… Then you will be asked to challenge yourself in the Proving Grounds. Will YOU be able to beat your score? Either way, the results when you cross the finish line will be rewarding. 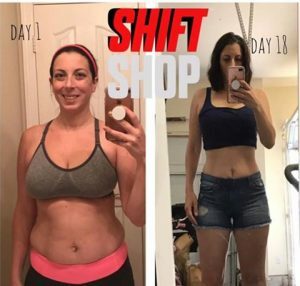 Because of Chris’ ramp-up method, and because there’s an incredible modifier to follow, anyone can use SHIFT SHOP to help YOU reach your goals. There are four new SHIFT SHOP workouts — the two Quick Shift workouts get you prepped before you begin the program and you’ll work in the Proving Grounds routines twice a week to test your performance against the clock. Quick Shift: Speed A 15-minute agility routine designed to get you ready for the timed challenges you’ll face during the Proving Grounds workouts. Quick Shift: Strength Prep for your strength challenges with a 15-minute resistance routine that’ll get you pumped for what’s to come. 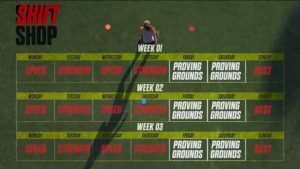 Proving Grounds: Speed Test your coordination, endurance, and mental muscle with speed and agility drills. Go up against Chris and his team and set a score you’ll aim to beat week after week. Proving Grounds: Strength Face resistance challenges and prove yourself by scoring high on reps performed and weight moved. Speed :25 Jump-start your cardio with 1-minute intervals designed to work your entire body and make you break a sweat. Strength :25 Build a strong foundation with easy-to-learn 1-minute intervals of resistance movements designed to set you up for success. Speed :35 Intensity increases as do the formations. This workout was designed to improve your agility, build your stamina, and burn more calories. 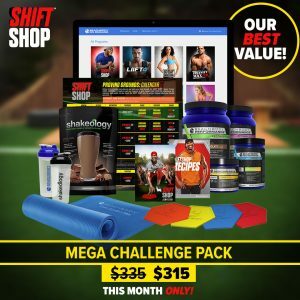 Strength :35 By combining the foundational moves, the intensity ramps up, creating new challenges as you continue to get stronger. Speed :45 Up the ante with new dynamic drills that continue to ramp up your conditioning and help get you ready for any challenge. Strength :45 The ultimate resistance workout created to challenge every muscle group to increase definition and get the very best out of you. Shift Core Strengthen your core as you breathe through nine 1-minute ab-shredding exercises. Shift Mobility 20 minutes of focused stretching to help alleviate tightness and get you ready to continue your transformation. What Equipment Do I Need for SHIFT SHOP? 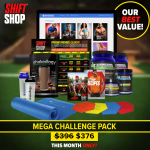 You’ll need Beachbody Agility Markers (available in all the new SHIFT SHOP Challenge Packs and Accessories Bundles Shown below) and a set of light and medium weights. Although not required, a mat is also recommended. We recommend doing SHIFT SHOP cardio workouts in a 6 x 6 foot space. But if you have more room, you can space out the markers even farther for more of a challenge. What Nutritional Supplements Do You Recommend for SHIFT SHOP PROVING GROUNDS? 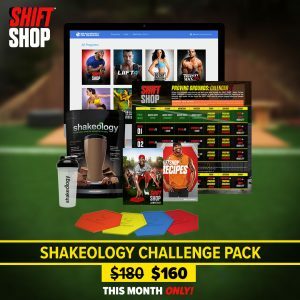 First and foremost, we recommend drinking Shakeology daily to help you build a strong nutritional foundation. New changes to diet or exercise habits can increase the demands on your body. 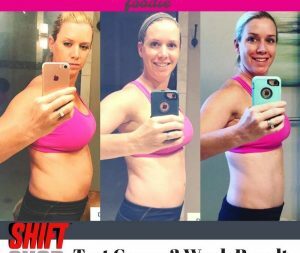 Shakeology helps your body get more of the nutrients it needs every day. It’s one simple thing you can do for yourself in your busy day — an investment in you and your health. We also recommend Beachbody Performance supplements. The Simple Shift Nutrition Guide sets you up with a nutrition plan you can stick with. You’ll be assigned a meal plan based on your current weight that dictates how many servings of each category (carbs, vegetables, protein, etc.) you can eat every day. As you ramp up from week to week and the workouts increase in intensity, you’ll cut back on starchy carbs and replace them with vegetables and protein to fuel the burn. Every meal counts as you shift your mindset and continue to progress. 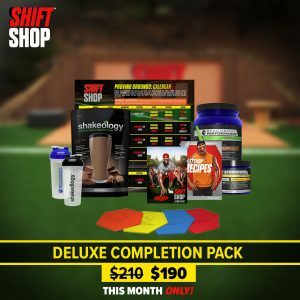 You can also follow the Portion Fix container system or use the 2B Mindset nutrition program together with SHIFT SHOP. What matters most is that you pick a nutrition plan that works for you.